English soldier, diplomat, historian and religious philosopher, eldest son of Richard Herbert of Montgomery Castle (a member of a collateral branch of the family of the earls of Pembroke) and of Magdalen, daughter of Sir Richard Newport, was born at Eyton-on-Severn near Wroxeter on the 3rd of March 1583. After careful private tuition he matriculated at University College, Oxford, as a gentleman commoner, in May 1596. On the 28th of February 1599 he married his cousin Mary, daughter and heiress of Sir William Herbert (d. 1593). He returned to Oxford with his wife and mother, continued his studies, and obtained proficiency in modern languages as well as in music, riding and fencing. On the accession of King James I he presented himself at court and was created a knight of the Bath on the 24th of July 1603. In 1608 he went to Paris, enjoying the friendship and hospitality of the old constable de Montmorency, and being entertained by Henri IV. On his return, as he says himself with naive vanity, he was "in great esteem both in court and city, many of the greatest desiring my company." In 1610 he served as a volunteer in the Low Countries under the prince of Orange, whose intimate friend he became, and distinguished himself at the capture of Juliers from the emperor. He offered to decide the war by engaging in single combat with a champion chosen from among the enemy, but his challenge was declined. During an interval in the fighting he paid a visit to Spinola, in the Spanish camp near Wezel, and afterwards to the elector palatine at Heidelberg, subsequently travelling in Italy. 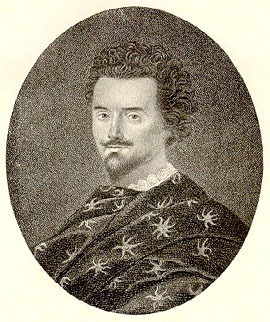 At the instance of the Duke of Savoy he led an expedition of 4000 Huguenots from Languedoc into Piedmont to help the Savoyards against Spain, but after nearly losing his life in the journey to Lyons he was imprisoned on his arrival there, and the enterprise came to nothing. Thence he returned to the Netherlands and the prince of Orange, arriving in England in 1617. In 1619 he was made by Buckingham ambassador at Paris, but a quarrel with de Luynes and a challenge sent by him to the latter occasioned his recall in 1621. After the death of de Luynes Herbert resumed his post in February 1622. He was very popular at the French court and showed considerable diplomatic ability, his chief objects being to accomplish the union between Charles and Henrietta Maria and secure the assistance of Louis XIII for the unfortunate elector palatine. This latter advantage he could not obtain, and he was dismissed in April 1624. He returned home greatly in debt and received little reward for his services beyond the Irish peerage of Castle island in 1624 and the English barony of Cherbury, or Chirbury, on the 7th of May 1629. In 1632 he was appointed a member of the council of war. He attended the king at York in 1639, and in May 1642 was imprisoned by the parliament for urging the addition of the words "without cause" to the resolution that the king violated his oath by making war on parliament. He determined after this to take no further part in the struggle, retired to Montgomery Castle, and declined the king's summons. On the 5th of September 1644 he surrendered the castle to the parliamentary forces, returned to London, submitted, and was granted a pension of £20 a week. In 1647 he paid a visit to Gassendi at Paris, and died in London on the 20th of August 1648, being buried in the church of St. Giles's in the Fields. Lord Herbert left two sons, Richard (c. 1600-1655), who succeeded him as 2nd Lord Herbert of Cherbury, and Edward, the title becoming extinct in the person of Henry Herbert, the 4th baron, grandson of the 1st Lord Herbert in 1691. In 1694, however, it was revived in favor of Henry Herbert (1654-1709), son of Sir Henry Herbert (1595-1673), brother of the 1st Lord Herbert of Cherbury. Sir Henry was master of the revels to Charles I and Charles II, being busily employed in reading and licensing plays and in supervising all kinds of public entertainments. He died in April 1673; his son Henry died in January 1709, when the latter's son Henry became 2nd Lord Herbert of Cherbury of the second creation. He died without issue in April 1738, and again the barony became extinct. In 1743 it was revived for Henry Arthur Herbert (c. 1703-1772), who five years later was created Earl of Powis. This nobleman was a great-grandson of the 2nd Lord Herbert of Cherbury of the first creation, and since his time the barony has been held by the Earls of Powis. Lord Herbert's cousin, Sir Edward Herbert (c. 1591-1657), was a member of parliament under James I and Charles I. Having become attorney-general he was instructed by Charles to take proceedings against some members of parliament who had been concerned in the passing of the Grand Remonstrance; the only result, however, was Herbert's own impeachment by the House of Commons and his imprisonment. Later in life he was with the exiled royal family in Holland and in France, becoming lord keeper of the great seal to Charles II, an office which he had refused in 1645. He died in Paris in December 1657. One of Herbert's son was Arthur Herbert, Earl of Torrington, and another was Sir Edward Herbert (c. 1648-1698), titular Earl of Portland, who was made chief justice of the king's bench in 1685 in succession to Lord Jeifreys. It was Sir Edward who declared for the royal prerogative in the case of Godden v. Hales, asserting that the kings of England, being sovereign princes, could dispense with particular laws in particular cases. After the escape of James II to France this king made Herbert his lord chancellor and created him Earl of Portland, although he was a Protestant and had exhibited a certain amount of independence during 1687. The first Lord Herbert's real claim to fame and remembrance is derived from his writings. Herbert's first and most important work is the De veritate prout distinguitur a revelatione, a verisimili, a possibili, et a falso (Paris, 1624; London, 1633) It combines a theory of knowledge with a partial psychology, a methodology for the investigation of truth, and a scheme of natural religion. The author's method is prolix and often far from clear; the book is no compact system, but it contains the skeleton and much of the soul of a complete philosophy. Giving up all past theories as useless, Herbert professedly endeavors to constitute a new and true system. Truth, which he defines as a just conformation of the faculties with one another and with their objects, he distributed into four classes or stages: (1) truth in the thing or the truth of the object; (2) truth of the appearance; (3) truth of the apprehension (conceptus); (4) truth of the intellect. The faculties of the mind are as numerous as the differences of their objects, and are accordingly innumerable; but they may be arranged in four groups. The first and fundamental and most certain group is the Natural Instinct, to which belong the nolitiae communes, which are innate, of divine origin and indisputable. The second group, the next in certainty, is the sensus internus (under which head Herbert discusses amongst others love, hate, fear, conscience with its communis notitia, and free will); the third is the sensus externus; and the fourth is discursus, reasoning, to which, as being the least certain, we have recourse when the other faculties fail. The ratiocinative faculties proceed by division and analysis, by questioning, and are slow and gradual in their movement; they take aid from the other faculties, those of the instinctus naluralis being always the final test. Herbert's categories or questions to be used in investigation are ten in number -- whether (a thing is), what, of what sort, how much, in what relation, how, when, where, whence, wherefore. No faculty, rightly used, can err "even in dreams"; badly exercised, reasoning becomes the source of almost all our errors. The discussion of the notitiae communes is the most characteristic part of the book. The exposition of them, though highly dogmatic, is at times strikingly Kantian in substance. "So far are these elements or sacred principles from being derived from experience or observation that without some of them, or at least some one of them, we can neither experience nor even observe." Unless we felt driven by them to explore the nature of things, "it would never occur to us to distinguish one thing from another." It cannot be said that Herbert proves the existence of the common notions; he does not deduce them or even give any list of them. But each faculty has its common notion; and they may be distinguished by six marks, their priority, independence, universality, certainty, necessity (for the well-being of man), and immediacy. Law is based on certain common notions; so is religion. Though Herbert expressly defines the scope of his book as dealing with the intellect, not faith, it is the common notions of religion he has illustrated most fully; and it is plain that it is in this part of his system that he is chiefly interested. The common notions of religion are the famous five articles, which became the charter of the English deists. There is little polemic against the received form of Christianity, but Herbert's attitude towards the Church's doctrine is distinctly negative, and he denies revelation except to the individual soul. In the De religione gentilium (completed 1645, published Amsterdam, 1663, translated into English by W. Lewis, London, 1705) he gives what maybe called, in David Hume's words, "a natural history of religion." By examining the heathen religions Herbert finds, to his great delight, the universality of his five great articles, and that these are clearly recognizable under their absurdities as they are under the rites, ceremonies and polytheism invented by sacerdotal superstition. The same vein is maintained in the tracts De causis errorum, an unfinished work on logical fallacies, Religio laici, and Ad sacerdotes de religione laici (1645). In the De veritate Herbert produced the first purely metaphysical treatise written by an Englishman, and in the De religione gentilium one of the earliest studies extant in comparative theology; while both his metaphysical speculations and his religious views are throughout distinguished by the highest originality and provoked considerable controversy. His achievements in historical writing are vastly inferior, and vitiated by personal aims and his preoccupation to gain the royal favor. Herbert's first historical work is the Expeditio Buckinghami ducis (published in a Latin translation in 1656 and in the original English by the Earl of Powis for the Philobiblon Society in 1860), a defense of Buckingham's conduct of the ill-fated expedition of 1627. The Life and Raigne of King Henry VIII (1649) derives its chief value from its composition from original documents, but is ill-proportioned, and the author judges the character and statesmanship of Henry with too obvious a partiality. His poems, published in 1665, show him in general a faithful disciple of John Donne, obscure and uncouth. His satires are miserable compositions, but a few of his lyrical verses show power of reflection and true inspiration, while his use of the metre afterwards employed by Alfred Lord Tennyson in his "In Memoriam" is particularly happy and effective. His Latin poems are evidence of his scholarship. Three of these had appeared together with the De causis errorum in 1645. To these works must be added A Dialogue between a Tutor and a Pupil (1768; a treatise on education, manuscript in the Bodleian Library); a treatise on the king's supremacy in the Church (manuscript in the Record Office and at Queen's College, Oxford), and his well-known autobiography, first published by Horace Walpole in 1764, a naive and amusing narrative, too much occupied, however, with his duels and amorous adventures, to the exclusion of more creditable incidents in his career, such as his contributions to philosophy and history, his intimacy with Donne, Ben Jonson, John Selden and Carew, Isaac Casaubon, Gassendi and Hugo Grotius, or his embassy in France, in relation to which he only described the splendor of his retinue and his social triumphs.